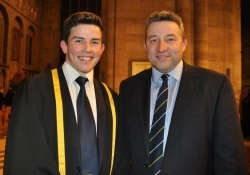 The third generation to attend Hereford Cathedral School, is following his father’s footsteps after 30 years by gaining the prestigious title of the ‘Head of School’. Will was delighted to be named as Head of School nearly three decades after his father, Peter (OH 1978-1985) , took on the same role. Will's family, who live in Dymock, have a long association with Hereford Cathedral School. As well as being Head of School in 1985-6, dad, Peter was captain of the cricket team, played 1st XV rugby and was RSM for the CCF. Both John and Peter took pride in supporting the HCS Marches 7s tournament and Peter continues to attend many OH events. John was also Hereford Rugby Club secretary for over 20 years in the 1970s and 1980s.